No matter how many times we hear these words from veterans arriving at our SongwritingWith:Soldiers retreats, it is always a jolt. We want to ask why? Why do these exemplars of will and courage get to the point of shutting themselves inside? What must be going on in their lives? We want to ask these things, but we don’t. Their guarded body language cues us to wait. Instead, we welcome our veterans, tell them how glad we are that they did leave their houses to come to the retreat. We know that soon, it’s likely many answers to our questions will emerge. Such statements of solitude came up at our recent May retreat, our first geared specifically to female military members, many of whom were mothers. Hearing I never leave my house from a mother is especially alarming. Our classic vision of motherhood—whether career women or stay-at-home moms—has them bustling around town with children in tow, playing in parks, assisting in classrooms. What happens when a mother feels too isolated, or too afraid, or too tired to leave her house? While we can’t know the home lives of the veterans coming to our retreats—mothers, fathers, brothers, sisters, spouses, singles, friends—we do know that they have overcome a variety of obstacles to get there. From facing agoraphobia, to getting leave for the weekend, to finding a babysitter, they all persevere to get themselves through our door and into a songwriting session. Again the questions arise. How did they do it? What propelled them out, at last? Small groups naturally form at picnic tables, on couches. 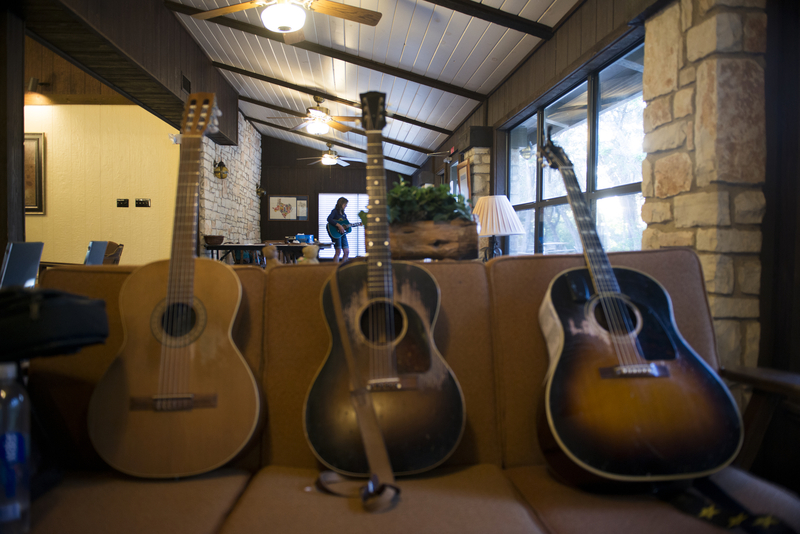 Guitars begin to strum as stories and questions volley back and forth. Often a fellow veteran is within earshot and joins in or quietly takes a nearby seat, staying longer than intended, captivated by the magical process that is songwriting. When the final words and chords ring true enough to satisfy all, a song is born. We hear deep sighs and see obvious relief on faces. Shoulders relax. There’s usually more than one hug and a knowing nod from a fellow participant. At this point, “I never leave my house” becomes “I thought I was the only one who felt that way,” or “When that happened to me…” These exchanges prompt veterans to sit down to eat together, or wander off side-by-side for a walk outside. By telling stories and writing songs that capture shared truths, our veterans realize they are connected, and that their service to their country and support of each other is truly meaningful. “When we connect with others during times of stress, we create resilience,” says psychologist Kelly McGonigal in her Ted talk on stress (recommended viewing). Helping our veterans create meaningful connections is immensely rewarding to us. We feel golden as we watch them move from sitting alone upon arrival to pulling up a chair and supporting each other while a song is performed; to see them sing the words to someone else’s song, to exchange embraces and emails as they leave. On the final day of our May retreat, the woman who started out the weekend by stating “I never leave home,” spoke up during our farewell circle. She told the group: “I feel like a better person. I got my voice back.” Her eyes as bright as her smile. We feel hopeful for her, for her family, as she heads home.